Heal Your Puzzle » Blog Archive » What is TRUTH? What is REALITY? What is ILLUSION? What is TRUTH? What is REALITY? What is ILLUSION? As a Kinesiology Practitioner, my treatments rely on the clarity of the muscle testing technique. During my own self-development it became increasingly more important to discern between Truth, Reality and Illusion… we are infused with all three but to heal ourselves and live an authentic life full of joy and fulfilment, we need to learn how to push past all the Illusion and realign our Truth with our Reality. Definition of TRUTH – “the quality or state of being true in accordance with fact or reality”, “a fact or belief that is accepted as true”. Definition of REALITY – “the state of things as they actually exist, as opposed to an idealistic or notional idea of them”, “the state or quality of having existence or substance”. Definition of ILLUSION – “an instance of a wrong or misinterpreted perception of a sensory experience”, “a deceptive appearance or impression”. TRUTH – this seems to be a little bit like moving goal posts eg. ‘The World is flat’ was a Truth until someone proved otherwise. Science clarifies facts, ‘Truths’, about our world in a very reliable, tried and tested way but also admits that assumptions are made where complete understanding is elusive… until technology moves forward, perceptions change or new discoveries are made and the goals update. When you hear or experience ‘Truth’ however it feels like the ‘ding’ when you tap a quality crystal glass: very clear, simple and strangely significant, an ‘aha!’ or ‘O M G!’ moment. REALITY – is included in the definition above about Truth which is somewhat true (!) but can also be very different. Everything is Real; everything has Energy – atoms, electrons, quantum particles – even your thoughts and emotions. ‘Reality’ is about ‘existence or substance’ so as much as you believe something to be True, does the REALITY around you confirm this? 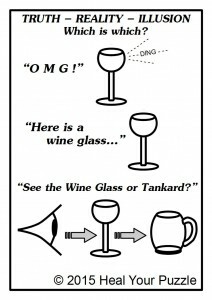 “Here is a wine glass…” – simple. Even if you are Empowered and being True to who you are, this needs to be grounded in ‘Reality’ for that feeling of inner peace and alignment with the Flow of your Life. ILLUSION – we live in a multidimensional Universe. Your experience may sometimes feel unreal; you may see a wine glass but sense something else behind the scenes… a beer glass?! You cannot see it until you move the wine glass out of the way but you know it is there!